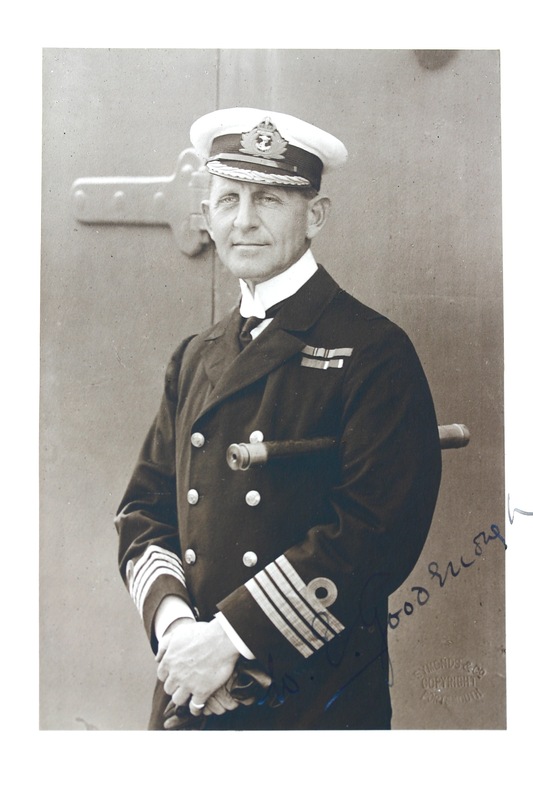 At 16:48 Commodore “Barge” Goodenough sent a stunning signal back to his commander, Vice Admiral Sir David Beatty. Scouting ahead of the 1st and 2nd battle cruiser Squadrons, Goodenough had just spotted sixteen dreadnoughts of the High Seas Fleet sailing north preparing to spring the trap on Beatty who had been lured south towards Hipper. “Urgent. Priority. Course of Enemy’s battlefleet, N., single line-ahead. Composition of van Kaiser class. Bearing of centre, E. Destroyers on both wings and ahead. Enemy’s Battle Cruisers joining battlefleet from Northward. My position Lat. 56° 29′ N., Long. 6° 14′ E”. The vital signal warned Beatty and now he was able to turn the trap around and bring Scheer to Jellicoe’s guns instead. The effect of the signal was also stunning to Beatty who, like Jellicoe, did not expect (and had been told not to expect) the main German battle Fleet. Petty Albert William Garland Symonds was the fifth of seven children born to William and Emily Symonds on July 2, 1888. He was educated at the Royal Hospital School, Greenwich, and served 25 years in the Royal Navy, retiring as a Chief Writer. I have worked very closely and with great pleasure with the staff and students of the new Royal Hospital School to commemorate their special link to Jutland. The school lost 101 of their former pupils at the battle. When Albert got back to Rosyth on the evening of June 2nd, he wrote up his experience and memories of the battle. What he wrote is below. I am writing this at 6 PM on the evening of Friday June 2nd 1916. The ship is at Rosyth and we reached this base at 2 PM today having left it at 9 PM on Tuesday 30th May. In the interval a Naval action of some magnitude has taken place. HMS Southampton played her part in it and it has been an honourable if somewhat trying part which we have played. It is of course inevitable that one ship, not to mention one individual like myself can form but an indifferent opinion of the complete results and actions of a ‘show’ such as this last one. But it so happened that circumstances dictated that this ship should see as much of the action, if not more than any other ship. Also my position in the ship as a Control Officer of the After Control, only became a busy one under two circumstances. At 9 PM we weighed and proceeded, no one in this ship knowing at the time the object of the operation. It does not in fact appear that we had great expectations of seeing them as we cruised East all Wednesday forenoon at no very high speed. By noon we had steam for “full speed” at 1⁄2 hours’ notice but as we were well over towards the Danish coast, this order partook more of the nature of routine than of anything else. The course of the Fleet was approx. East and the L.C. (Light Cruiser) screen was spread 1st L.C.S. (Light Cruiser Squadron) – 3rd – 2nd L.C.S. (ourselves) from North to South. 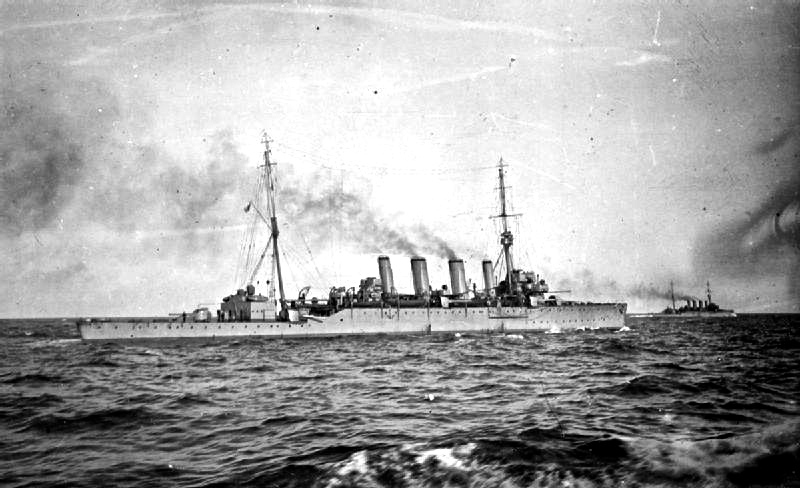 At 2.23 PM “Galatea” sighted two enemy Light Cruisers and much smoke bearing East. At 2.56 PM they reported the German B.C. Fleet. We held on our Easterly course until 3.55 PM the B.C. came into line, steering South with the “Lion” leading and they at once opened fire on the German B. C. Fleet We were on the “Lion’s” starboard bow and on our port beam was a number of T.B.D’s. (Torpedo Boat Destroyers) and the “Champion” (Light Cruiser). As soon as we opened fire (and by “we” I mean our B.C.) the Germans opened fire as well, if not before. It must be realized that whilst our own B.C. were only a mile or so from us the Germans were about 20,000 yards away and against a very dark background, whilst we were silhouetted against the Western sky. The tactical disadvantage was very great, as it was extremely difficult for our B.C. to see the German B.C. It was of course still harder for us to see the Germans, in fact all that we ever saw of the enemy during the first period of the action was a series of flashes on the horizon. We were therefore helpless spectators of the severe punishment our own B.C. were suffering without having the consolation of seeing what damage the Germans were experiencing. As has been the custom before, the German shooting was initially very good. Our B.C. were foaming through enormous splashes and it was evident that our line was being straddled. I was watching the line at 4.15 (approx.) and I had just noted with satisfaction that the “Lion” was emerging from a collection of huge fountains of water when I was horrified to see a colossal column of grey white smoke stand on the water where the “Indefatigable” (Battle Cruiser) had been. This column of smoke which I estimate was 700 feet high expanded on top into a great mushroom. The base of this mushroom stalk became a fiery red. I realized the “Indefatigable” had been blown up and the next thing I remember was seeing the next ship in the line coming through the place where she had been. I cannot attempt to describe my feelings when the action having proceeded as before vis: – flashes on the horizon, columns of splashes around our Battle Cruisers, salvoes from our B.C. At 4.23 PM in an almost similar manner the “Queen Mary” (Battle Cruiser) was obliterated by an 800 feet high mushroom of fiery smoke, in this case I remember seeing bits of her ‘flying upward’. As I watched this fiery gravestone, it seemed to waver slightly at the base and I caught a momentary but clear glimpse of the hull of the “Queen Mary” sticking out of the water from the stern to the after funnel. (1) We thought there might be the chance of making a torpedo attack. (2) We wished to have a good look at them and report accurately. With these intentions we held on and on, ever drawing nearer to this formidable line of German Battleships. I could see them plainly and counted 16 of them led by the four “Koenig’s” with the six older ones in the rear. Every moment it seemed as if they must open fire and obliterate us, but luckily they decided we were not worth ammunition at this stage of the proceedings. Finally, at a range of 12.900 yards we discovered we could not get into position for a torpedo attack so we turned 16 points and steered Northerly with the German B.C. on our starboard bow and the German Battle Fleet on our starboard quarter and beam, this was at 4,45 PM. When the “Lion” and remaining B.C. turned 16 points to North or North by West the German B.C. seeing their Grand Fleet coming up from the South also turned 16 points. Our B.C. was then engaged with the German B.C. but we could not see much of this, then came a gap of a couple of miles then the 5th B.S. heavily engaged with the leading half of the German line. Close to the last ship of the 5th B.S. was the “Southampton”, sometimes we were 4-6 cables on their disengaged quarter, at other times we were almost astern. Away on our port quarter were some destroyers and the other ships of our squadron. ‘For the following hour, 5pm to 6pm, I can truthfully say I thought each succeeding minute was our last. For that hour we were under persistent 11in shellfire from the rear of the German fleet. That is to say, all the German battleships which could not get to our battleships thought they might as well while away the time by knocking us out. ‘Needless to say we could not fire a shot in return as the range was about 16,000 yards, way beyond our guns. ‘I crouched behind the 1/10in plate of the after control with Hayward-Booth (the Sub.) and the Clerk and we gnawed on bully beef. However, my throat was so dry that I could not get much down and we could not get any water. About once a minute or perhaps thrice in two minutes a series of ear splitting reports would indicate that another salvo had burst around the ship. Against my will I could never resist hanging over the edge and then I saw half a dozen or four muddy foamy looking circles in the water over which black smoke hung. Sometimes these pools were one side, sometimes the other. Some were literally absolutely alongside the ship and those threw masses of water onboard drenching us to the skin. I should say (and this is a carefully reasoned and considered estimate) that 40 large shells fell within 75 yards of us within the hour and many others at varying distances out. We seemed to bear a charmed life but it was obvious that such a position could not last forever. How we escaped for an hour amazes everyone from the Commander downwards but providence was with us. We did escape until the arrival at 6.17 PM of Sir J. Jellicoe and the Battle Fleet, this caused the action to enter a 3rd phase. Before proceeding with the third phase of this unique and historic day (a very milestone if not turning point in Naval history) I must emphasize one highly important point which belongs of right to both the 1st and 2nd phases of the action. I refer to the question of light. This highly important factor was very greatly in the enemy’s favour during phases one and two. (i.e. Phase One: B.C. against German B.C. Phase Two: 5th B.S. and B.C. against German B.C. and High Seas Fleet). The fact of this being so was of course due to our relative positions and the time of day. Though at 4 PM the sun was still high in the heavens it was to the N.W. of us and we were to the West of the enemy. As this wonderful afternoon drew on and the sun sank lower towards the N.W. horizon the British ships were silhouetted against the illumination in the sky. The enemy showed up indifferently against a mass of low lying dark grey and purplish clouds. Having stated this most important point I can now describe how at 6.17 PM I heard with the keenest satisfaction that Sir John Jellicoe who had been hurrying South with the Grand Fleet Battleships and armoured cruisers had been sighted right ahead. It is neither my place nor my province to discuss in a descriptive account such as this, the tactics employed on the 31st May – 1st June. But I cannot allow myself to go any further without expressing my admiration and delight at the masterly gunnery in which the Commander-in-Chief worked round the Germans to get good light, by putting them to the Westward of him. When one considers that he could not be considered as fully prepared for a General Fleet Action and that he had been obliged to come rushing South to get us out of a hot corner his success is still more magnificent. When the Battle Fleet deployed to the Eastward our B.C. passing across the bows of the Fleet took up their positions in the van where also to be found the 1st, 4th and 3rd L.C.S. and Destroyers. The 5th B.S. joined up quite naturally at the tail of the line and we remained astern of them with the “Faulknor” and her destroyers. As our Grand Fleet deployed I saw a terrible sight, I saw a four funneled cruiser apparently steering down between the two Battle lines, she was moving surrounded by splashes and was in hell. At 6.25 that terribly familiar column of smoke rose over the spot where I had last seen her. It was the end of the “Defence” (armoured cruiser). From amidst the welter of confusion a second 4 funneled cruiser appeared steering about West at 7 knots, she was heavily on fire aft and seemed in a bad way. Painfully she crept across the end of our Battle Line and drew clear of the inferno which was still lashing the water where the “Defence” had gone down. After we had seen the “Defence” go down and as the “Warrior” hauled across out of it, the line of battle became formed and action became general. Shortly afterwards we were amazed to see “Warspite” suddenly turn to starboard and steer towards the German Fleet. I guessed at once she had been hit in the steering gear. For three or four thousand yards she went towards them coming under a hail of huge shells as the German Battle Fleet or rather portions of it concentrated on her. I was prepared to see her go up at any moment as it did not seem possible she could survive, the more so as she seemed to be stopped. This lasted some ten minutes when to our astonishment she re-appeared again from amongst the cascades of splashes and smoke around her and steaming strongly came up to the rear of the fleet again. As a matter of fact, she was ordered shortly afterwards to repair to Rosyth for Repairs. Action may now be said to have become general. Our long line of Battleships stretching away literally for miles to the N.E. and gradually curving around the Germans. (Though the speed of the fleet was only 17 knots) they presented an inspiring and heartening spectacle as they proceeded majestically along. survive, the more so as she seemed to be stopped. This lasted some ten minutes when to our astonishment she re-appeared again from amongst the cascades of splashes and smoke around her and steaming strongly came up to the rear of the fleet again. As a matter of fact, she was ordered shortly afterwards to repair to Rosyth for Repairs. Salvo after salvo belched out from the long line of these great ships now confronted for the first time in their careers with the enemy they had waited to see for so many weary months. Firing was not very rapid to begin with as the light was still very poor but as the boot was shifted to the other leg and the Germans became outlined against the western sky the Battleships warmed to their work and an almost continuous succession of jets of flame and brown balls of cordite smoke shot out from the British Battle Fleet. At 6.47 PM we observed a 3 funneled German Battleship lying between the tail of our line and the German line, she was stopped and on fire. Having nothing particular at that moment on his hands our Commodore Goodenough decided to run over towards her and work our wicked will on her. The fleet at the time was only steaming at 17 knots so we saw that we should have no difficulty in rejoining the rear of the Battle Fleet. At 6.50 we turned to about S.E. and ran down at high speed supported by our squadron to where this 3 funneled German Battleship (probably the Pommern) wallowed in her agony. As soon as we got within range the Squadron opened fire and we could see several shells, in fact a very large number burst on her, the six rear ships of the German line had in my opinion preserved an ominous silence whilst we advanced to batter their helpless brother. It was the calm before the storm for when we were about 6,000 yards from the 3 funneler and 12,000 yards from the German Battle line they opened a very heavy fire on our Squadron, we fled helter skelter to get back to the rear of our own lines pursued by a perfect shower of 11 inch shells which ‘crumped’ down alongside us in astounding precision. As an instance of what we had for ten minutes I may mention that Booth and myself were in the After Control together making feeble jokes about the shells which were greeted by our Control Party with hysterical laughter of a somewhat forced nature, and at 7 PM we observed 3 salvo’s of 3 or 4 shells in each strike the water together. We agreed that 2 salvo’s aggregating 7 shells fell alongside the starboard side of the ship, distance about 15 to 50 yards and one bunch of 3 fell 40 yards on the port side at the same time. A regular stream of about one every 15 seconds was falling just ahead of the ship on either bow drenching people on the bridge with their spray. At 7.15 we were out of range astern of the 5th B.S. (The Q.E’s) who were loosing off steady salvo’s from their 15 inch guns. Although the sea was flat calm the surface was heaving with a sullen swell simply due to the tremendous number of ships of every size and speed which were moving about, it was very difficult for us to steer due to this. Over the whole scene hung brown clouds with the vapour from hundreds of funnels pouring smoke spread over the 100 miles of sea (10×10) in which the main action was being fought. At about 7.15 the Commander-in-Chief had managed to get to the East North East of the enemy, which later in order to avoid having his track crossed and as he was also being menaced by a destroyer attack turned to the South East. The light was now in our favour and during the next 10 minutes the enemy Battle Fleet must have suffered very heavily from our Fleet. I had an impression at the time that German T.B.D’s (Torpedo boat destroyers) endeavoured to attack our van. The distance was so great that I could not be sure. I have since heard it was so and that they were beaten off. At 7.30 PM the Germans had experienced enough for I suddenly saw the rear ships of their line alter course 8 points together. So apparent was this manoeuvre that I sent a written message to the Commodore drawing his attention to it. At the same time his destroyers at the S.E. end (or van) of his line started a smoke screen which by 7.35 was effective having drifted the length of their line. Under cover of this, they retired. Our Battle Fleet held on a Southerly course as the enemy had been obliged to retire to the S.W. and there seemed a good chance of cutting them off from Germany. It has just occurred to me that if the “Marlborough” was torpedoed it might have been this little hornet that did it, for she must have been closer to our line than any other German T.B.D. However, this is only a surmise. At 8.25 “Birmingham” sighted a submarine, perhaps this got the “Marlborough”? At 8.30 the Fleet was in columns of divisions, we the 2nd L.C.S. were in line ahead on the starboard beam of the three remaining ships of the 5th B.S. (“Warspite” had gone home) At 8.50 PM we sighted four German T.B.D’s on our starboard bow apparently intending an attack on the Battle Fleet, probably the 5th B.S. We opened fire at once and hit the leading one, though the dusk made shooting very difficult. We drove the others off and they vanished with their tails down. At 9 PM heavy firing and flashes ahead and to the S.E. I found out afterwards this was the 3rd L.C.S. and our B.C. who had been feeling their way to the Eastward to see if our Fleet was trying to get between the Germans and their base. At this stage of the proceedings only 3 German B.C. were going about together. At about 9.15 or 9.30 we eased to 17 knots, we were astern of the Battle Fleet and course South. At about this time I drank a little tea which I found, it had no milk or sugar but it was good. Booth also found a slab of chocolate in his cabin. At approx. 9.40 we suddenly saw a flotilla of destroyers rushing at us, just as we were about to open fire we saw they were our own. As they dashed past our line (how we cursed their haphazard behavior), one of them fired a 4” at us, but didn’t hit anyone. I imagine a Gun layer lost his head. At 10 PM searchlights were suddenly switched on, away on our starboard beam. In a few minutes the lights went out and we were once more straining our eyes in staring out on all sides. When it became dusk we went to night Defence Stations and I went to the bridge as our arrangements are that the Gunnery Lieutenant should control one side and that I control the other. In conversation with him (Burroughs) we had agreed that as in the event of a night action it was improbable, or at all events devoutly to be hoped that we should not be engaged both sides at once, that if we did get into action I should go down into the battery and preferably the waist, quarterdeck and after end generally, as owing to their distance from the bridge, communication to these positions and the guns there are precarious. It is therefore advisable to have an Officer on the spot if possible, for coolness in a night attack is obviously essential. The time of which I am now writing is 10 PM on 31st May having watched the night action described at the end of Part I, I decided to rest for a little. I was on the bridge at the time and looking round I discovered the canvas cover of a searchlight, curling myself up in this I lay down at the base of the steering compass. The narrative will now assume a distinctly personal character but this is inevitable for did I attempt to give a general description of our night action I should be bound to fail. It would be impossible for one individual to do so. I can simply record what I experienced and what I saw together with what I heard immediately afterwards. At 10.15 I heard someone say that a line of cruisers had been seen on the beam, getting up I went aft and looked in on my way at the After Control where I found Mr. Cabage (Bosun) and Booth who declared they could see German cruisers on the beam. It was a German scouting group consisting of “Fürst Bismarck” or “Rion”, “Augsburg”, “Kolberg”, “Rostock” ? (1) Observers aft declare they saw one of the German ships struck by a torpedo and suffer a very heavy explosion. Of course these reports cannot be considered very reliable owing to the circumstances under which they were made. (2) Officers’ in the ships astern have told me that they observed an underwater explosion in one four funneled cruiser in the German line. (3) Next day we passed a place where a ship had gone down, this coincided very nearly with the spot where we had our action. (4) If the enemy did not suffer any very exceptional loss, why did they shear off when they must have seen that another five minutes would have sunk us (“Southampton”) unless they thought that we could not possibly survive with our big fires and that why together with their admission of the “Rostock” they persist in claiming the “Birmingham”, evidently us. I must confess that we must have presented a very comforting sight to German eyes. The Sergeant Major gallantly dashed forward to turn on the fire main at “H” but no water came as the pipe below had been pierced by a shell. As I have already said I was standing behind the gun when another shell hit, this shell on bursting against the side killed the breech worker of the gun near me and also the loading number standing just to my left front. It also knocked out and wounded the whole of the rest of the guns’ crew except three men, there were left these three or two, I’m not sure exactly, the Sergeant Major (severely burnt) and myself, slightly singed. When we saw that the fire main would not work we managed to get a hose up the hatch and bring it round, whilst doing this I looked up to the boat deck and saw a sight which almost paralyzed me with horror. An enormous fire was raging between the 2nd and 3rd funnels. Every now and then it showed signs of dying away only to flare up again as high as the top of the funnel. It lit up the whole ship and one could feel its heat. It quite obscured another fire which I found out afterwards was going under the fore bridge. Every moment I thought, as did everyone else onboard and also people in the ship next to us, that we should blow up. I must explain that though I hardly realized it at the time, an Armoured cruiser, (either the “Roon” or “Prinz Heinrich” and four light cruisers were concentrating on us. With the exception of one or two shells which did some damage to the “Dublin” (she had the Navigator and one man killed, 9 wounded) none of the rest of the squadron were touched. To get back to the story…. Whilst we were putting out the fire another shell burst on the starboard after searchlight killing two or three men up there and hurled the remains of it down on top of us in the waist, as far as I know it killed no one. When we had put out the fire I dragged a hose up the port ladder to the boat deck, falling over a heap of about three dead men on the way. When I got to the central fire it was being got under control. I met the Commander there, also Booth and also saw most of P.3’s gun’s crew dead by their gun as were also S. 3’s, they were lying on the deck. Whilst this fire had been raging we were lit up from stem to stern and the enemy let drive at us for all they were worth. As this fire died down the enemy put out their lights and sheared off, either this was due to the punishment they had received or some other cause. At all events we held our course and they turned away. Darkness succeeded light and groping my way forward I passed a number of dead men and came across a boy (Mellish), a splendid little chap, one arm and a leg was off. He was bleeding to death, quite conscious and most plucky, I had him taken below as well as many others, Mellish died one hour afterwards. On reaching the bridge I met the Commander who sent me to report casualties, I went down aft stopping to see some dead put over the side and then down the hatch to the central passageway which was in places running with blood. The doctors were operating in the Stokers bathroom; they were doing an amputation when I arrived. Not a murmur rose, not a sound, not a groan came from these wrecks of humanity lying on the deck, the tables and the sideboard. A whispered request for a cigarette was all I heard. Going up to the bridge again I told the Commander what I could and then went down to the battery where the Lieut. (G) and the Commander were making up sufficient guns’ crews with stokers to man one side if required. We also did our best to test and restore communications which in most cases were blown to stems. Having done what, we could, Booth and myself went up to the bridge and lay down on the searchlight cover as there was nothing else we could do. We found a lot of blood there so we shifted ground. Suddenly firing started right astern, supposedly Battle Cruisers in action. I prayed to heaven we should not run up against them, with only enough men left to man one side and even then the loading numbers were stokers, we were in no state to fight. We increased to 20 knots and when dawn was breaking we sighted a number of Battleships right ahead. Such is the uncertainty of night work that for one or two painful moments we were not sure of their identity, but luckily they were our own. The scene on the upper deck defies description and in places it was so horrible that I will not describe it. The funnels were riddled with holes large and small and most of the upper deck casing and the boats were coloured a bright yellow from the melinite fumes. Of the boats, only one was fit to put in the water. Down below, the smoking room flat presented an extraordinary appearance, Marsden’s cabin and Stoddart’s on the starboard side were utterly wrecked as two shells had passed through here. One had carried on into the Wardroom and the other had made its way across the ship into mine doing a good deal of damage and smashing the scuttle. All my gear was on the deck and there was about six to nine inches of water (chiefly through my broken scuttle) everywhere. It was a painful sight. A shell went into the Commodore’s cabin high up but did nothing, another entered Booth’s cabin and smashing through his bunk entered the Wardroom and fetched up with some violence against the soda water machine. A 9.4” entered the ships’ side through the Carpenter’s cabin, killed two men in the flat and did damage I have already described in the waist overhead. The funnels were hit repeatedly and there were several direct hits on the deck which did tremendous execution amongst the gun crews near them. Two or three direct hits under the bridge caused a fire and deaths under and on the bridge itself. There were further hits along the side, some of which were kept out by our three inch armour, but one big one penetrated and wrecked the First Lieutenant’s cabin. Others came in and smashed the Gunner (T) and (G’s) cabins. A big one entered the stokers number two mess deck and killed some men there, it also gave some trouble as it was on the waterline. This one and the one in the Carpenter’s cabin were the only ones which leaked at all badly once we had plugged and shored them all up. The main suction kept the water from these in hand. As to our movements during the 1st June and also as to a detailed list of our injuries, they are not really of great general interest. The Germans probably doubled back on their tracks and though we were between them and their base the weather was misty and they escaped the Commander-in-Chief’s Grand Fleet. We passed some very large mines and a T.B.D. bottom up whilst we were cruising about in the Bight looking for the Germans. At twelve noon we packed up Action stations having been at them for 23 hours and we returned to base. On the way in we had to heave to once during the night as a small gale caused some of the shores to carry away and we began to leak rather badly. ” There were not many atheists’ onboard us at 11 PM, though there might have been some at 10 PM”. Said Writer A.W.G. Symonds has served under me from 27th October 1915 to 15th February 1917. He has always carried out his responsible duties here with accuracy and loyalty. In several trying and arduous situations, including the Battle of Jutland, 31st May 1916, his conduct has been in every way satisfactory. I have no hesitation in recommending him for a position of responsibility and trust.